Clovis Crawfish and his pals return for another adventure on the Louisiana bayou. 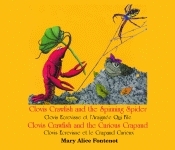 In Clovis Crawfish and the Spinning Spider, Simone Spider threatens the peaceful region by building her silver web near Clovis’s mud house. When little Josette June Bug comes to the bayou, she gets tangled in the lair. Will she be able to fend off the hungry Simone until Clovis and his friends can rescue her? In the adventure of Clovis Crawfish and the Curious Crapaud, Clovis and his friends learn to appreciate each other a little better. Corinne Crapaud is Fernand Frog’s shy cousin. Fernand insists that she is ugly and stupid, but instead of crying or arguing, Corinne puffs up and gets bigger and bigger. When the rain causes Clovis’s mud house to start melting, Corinne is puffed up so large that she gets caught in the hole, and only friendship can save her. Julie Fontenot Landry has been honored with the CODOFIL Prize for French prose. She is a member of the Louisiana Folklore Society and the Philological Association of Louisiana. She has written articles for the Louisiana English Journal and the Louisiana Folklore Miscellany.